Leasing a computer or audio-visual equipment is a great idea but why? Here are seven more reasons why you should consider leasing instead of buying. 1. Preserve Your Credit Lines: Leasing helps you eliminate the hassle and worry opening a new line of credit. Instead of relying on credit to make a purchase, you can lease and pay only for what you use. Also, companies who lease tend to me more flexible than those who offer you credit. 2. Advantages in Technology: When you buy technology, you're stuck with it. Just because a new technology becomes available, doesn't mean you can run back to the store for an update. When you lease, you'll always have the latest, state-of-the art equipment such as laptops, desktops, copiers, flat screens displays, file servers, projectors, software and more, depending on what fits your needs. 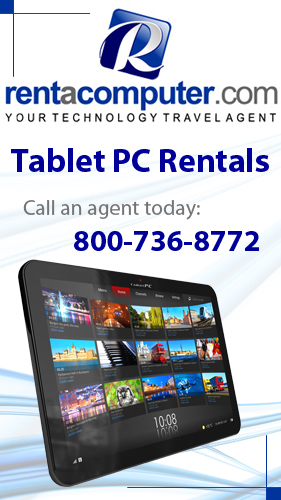 Also, companies such as Rentacomputer.com have Tech Travel Agents who are experienced with the equipment they are leasing and who can handle everything from delivery to set-up and maintenance. 3. Little or No Down Payment: Most of the time, when leasing equipment, a down payment is not required. 4. Preserve Your Capital Budget: Due to the lack of initial capital expenditure, your working capital will not suffer. Also, your lease payments will be less than they would have been had you purchased. 5. Potential Tax Savings: Computer leasing may even lead to tax deductions. To see if your company qualifies, check with your accountant. 6. Financial Options: Leasing equipment presents you with a number of options. These include lease purchases, fair market value buy-outs, and structured payments designed specifically for your company. 7. Flexible Terms: Leasing is great for when you need equipment for a longer period of time. Whether it's one year or five years, terms are flexible and will fit whatever needs your company has.